Q. Who invented Italian Beef? A. Pasquale Scala, a South Side butcher during the 1920s, is largely credited with introducing the sandwich to hungry Chicagoans during the Depression. Scala’s Original Beef & Sausage Company still supplies many of the city’s Italian beef spots with the key ingredient: thinly sliced beef. On the retail side, Al’s Beef was one of the first stands to serve up the sandwiches beginning in 1938. Most restaurants serve the sandwiches dry, wet, or dipped, indicating the level of juice that is about to run down your face/hands/shirt. How much juice to order is a choice that depends on personal preference and how many rolls of paper towels you have available. Q. From what cut of beef is Italian Beef made from? Q. How is Italian Beef cooked? The beef is wet-roasted in a broth with garlic, oregano and spices until medium rare or medium. The roast is then cooled, shaved using a deli slicer, and then reintroduced to its reheated beef broth. Make your own beef, with our awesome tips and tricks! Q. How is an Italian Beef served? A. The Italian Beef sits in the broth, briefly. Once a sandwich is ordered, the beef is then drawn from the broth and placed directly on the bread. Because the meat is served dripping wet it is necessary to use a chewy bread, as a softer bread would disintegrate. Q. Is there a special kind of bread use? A. yes, The typical bread used is long, Italian style loaves without seeds sliced from six to eight inches in length. Q. Can Italian Beef be shredded instead if being sliced? A. Yes, some Italian beef can also be shredded instead of sliced. Depends on who has made the beef, it’s their preference, but mostly it is shaved. Q. Do all beef stands make their own Italian Beef? * NOTE: Most acclaimed Chicago beef places typically prepare the beef on their own premises according to their own recipes. Some produce their own homemade giardiniera as well. Q. When was the Cheese Steak invented? Q. Who has the most Italian Beef restaurants? The first Portillo’s hot dog stand known as “The Dog House” opened in 1963 on North Avenue in Villa Park. Q. How many locations does portillo’s have? A. The Portillo Restaurant Group is the largest privately-owned restaurant company in the Midwest. nearly 4000 employees and a total of 47 restaurants. Q. How many states can you get an Italian Beef in? Q. Who are the major bread distributors? Q. Is there a correct way to eat an Italian Beef? A. Yes, its called the “Stance” or rather The Posture: A bun barrier is all that seperates the eater from a mountain of oozy beef, so most Italian beef pros have perfected “the lean.” This method of eating at a 45-degree angle may look a bit silly, but so does returning from your lunch break wearing a grease tie. Check out the stance! Q. When was the first Al’s Beef opened? Q. Who ships Italian Beef? Q. So who has the best Italian beef in Chicago? A. Looks like the question is still up for discussion! 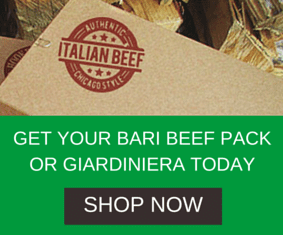 So go add, rate and review your favorite Italian Beef place now. Q. What is the most widely known Chicago Style food? A. The Chicago-Style Hot Dog — Although the Italian Beef is a close second, most of the Italian Beef stand sell the Chicago-Style Hot Dog, so we help promote it as well.